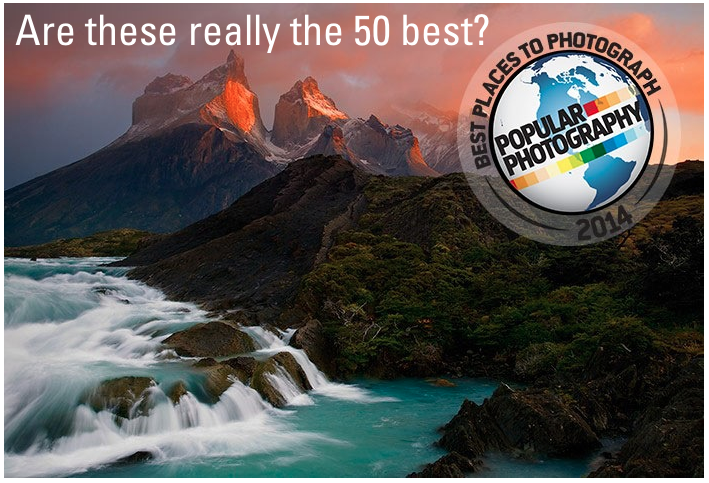 Are these really the 50 best places in the world to photograph? Get ready to update your bucket lists and fill your passports, Popular Photography released their 2014 Best Places to Photograph in the World. It is missing a few of my dream locations, but it looks like it includes some of your favorites. Antelope Canyon, AZ -- Linda raved about getting great shots here. She recommends Adventurous Antelope Canyon Photo Tours as a "photographer's dream" for the ultimate photo ops. Havana, Cuba -- Stephanie made me green with envy when she shared images from her recent trip to Cuba. I'm thinking this needs to go on my bucket list. Central Park, NYC -- Steve took us on a one-day marathon Meetup a few years back. This is easy and accessible. We went up and back in a day. Aurora Borealis, Fairbanks, AK -- Frank Audet taught us how to photograph the Aurora Borealis on his webinar. Tikal, Guatemala -- I'm guessing Keren is going to love this addition. She created quite the gallery of photos from her homeland. Machu, Picchu -- This wasn't even on my radar until Emily visited and shared so many photos on her blog, Bella Remy Photography. I think we were supposed to write a book about it. A Cowboys Game? -- I'm going to leave this one to you Redskins fans. We, in the Who Dat Nation, don't take too kindly to this one either. Maasai, Mara, Kenya -- I coached Audrey before she headed to Kenya to photograph a real safari. I couldn't sell her on my tag-along photo tours. This is on my bucket list as well. Grand Canyon, AZ -- I'm embarrassed to admit that I've never been to the Grand Canyon. So many of you return with great stories and photos. This is on my must-photo list. Grand Bazaar, Instanbul Turkey -- Elvan joined us at a couple Meetups having just arrived from Turkey. I bet she'd have something to say about this entry. Copacabana, Brazil -- We're hearing so much about Brazil with the World Cup Games underway. Name the beach after a Barry Manilow song, and we have all the reasons we need to visit. See the full list of 50 locations here. If you were creating this list of best places to photograph around the world, what would you want to add? Which of these locations have you visited? Tell me what should be here that isn't. What is here that should be.